Washing your face is the most important part of any skincare routine. Shop Vita MedSpa to find the best face wash for every skin type. Cleansers There are 4 products. This 100% soap free foamy cleanser helps to remove excess surface lipids without overdrying the skin. Contains 0.5% Salicylic acid with 3% Lactic acid for enhanced exfoliation. Suitable for normal to oily complexions. Directions: Twice a day. Gently massage cleanser over wet face. Rinse thoroughly with warm water. 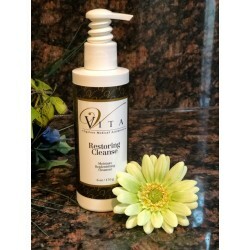 This creamy cleanser replenishes and moisturizes skin while gently exfoliating. It is perfect for normal to dry skin types and is best when used as a moisturizing masque and left on skin for 2-3 minutes before removing.